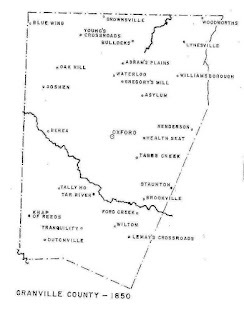 This is another one of my ancestors that has proved elusive, my great-great grandfather. It doesn't help that his name could be listed in many different, sometimes common, ways. 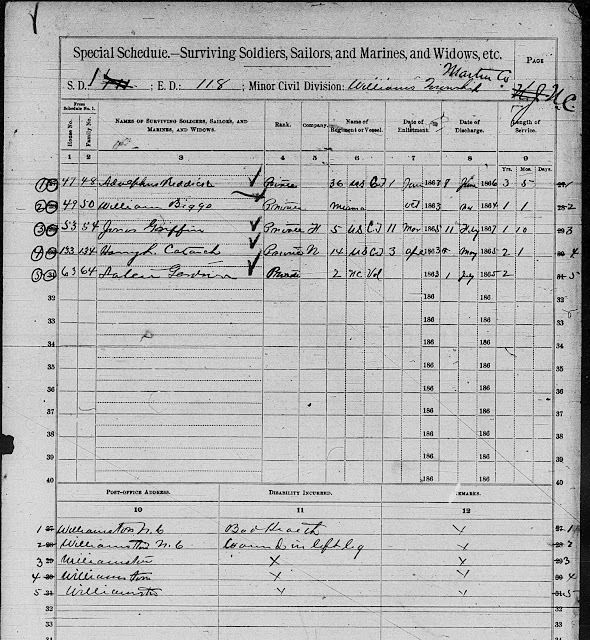 As of now, I think I've confirmed he has been listed as (in the order I found him): Gaston Cross, Garrison Cross, H. Garrison Cross and H.G. Cross. That makes it VERY tough to track him with only spotty records. I haven't been able to confirm any references to Henry Cross. Without an additional data point, it's just too much of a leap to rely on. Thank goodness for my great grandfather's unique name (Garfield), otherwise I would have doubted that this was indeed my great-great grandfather. I believe he was born in Arkansas in or around 1853, to Eliza Cross and a yet unknown father. 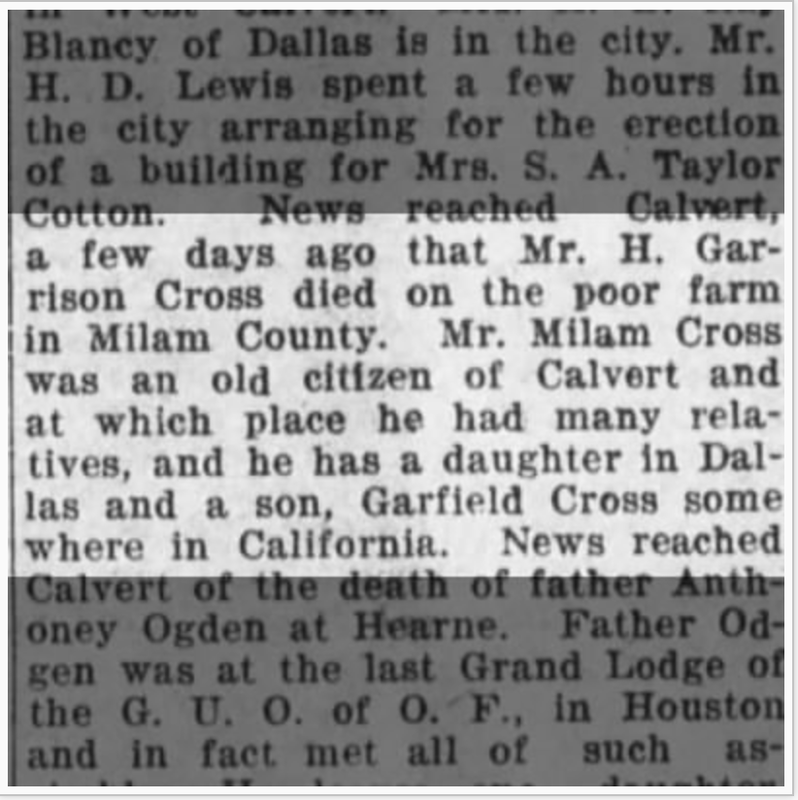 At some point prior to 1880, he, his mother and siblings (one of which was Alberta Cross) moved to Calvert, TX. 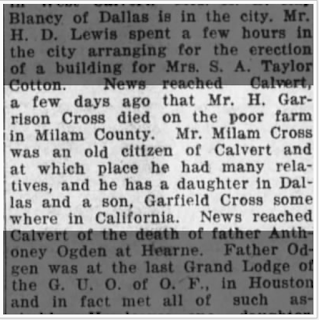 He lived in and around the Robertson County, TX area until his death (to my knowledge) in Milam County....as a pauper. I haven't been able to find much on the Milam County poor farm. And I doubt they kept many records. But I am so very grateful for whoever took the time to report his death. Because of which, I have been able to fill in another hole in my tree. And I found out that my great grandfather may have lived in California (?!?!) Another clue! My great grandfather was a bit of a rolling stone, from what I've been gathering. 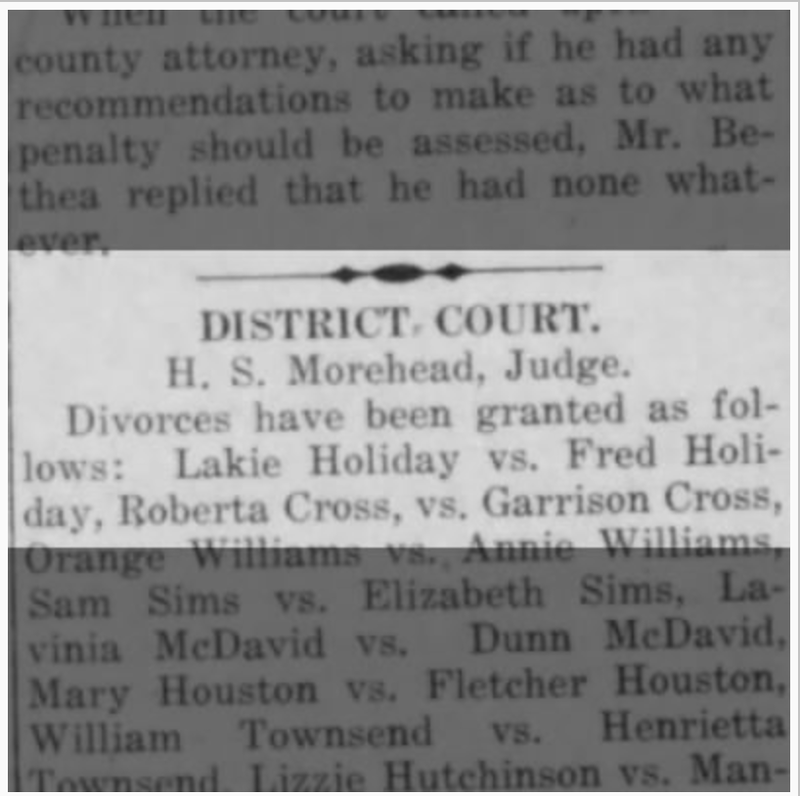 After his marriage to my great grandmother Josephine Anderson, he went on to wed or partner with at least two other women (to my knowledge) - Roberta Monroe and Mary Pugh. 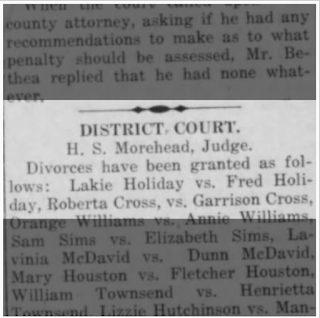 I was pleased to find this divorce notice only because it confirmed he was in fact married to Roberta Cross and it gave me another locale to search -- Bryan, TX.